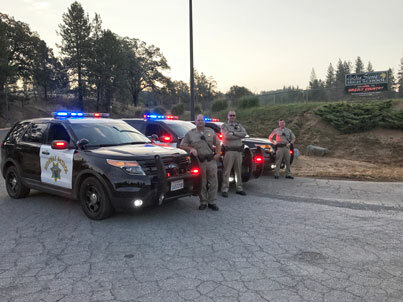 To keep students safe during the first days of school and to enhance safety awareness throughout the year, Placerville CHP implemented a special task force that provided extra patrol around campuses in August. The School-Zone: Traffic Safety Enforcement Operation, included Officers Ian Hoey, Mike Powers, Andrew Brown, Brent McElmurry, Brian Schneider, and Sergeant Varao. During this time, Officers issued warnings, but also wrote tickets for traffic violations such as speeding, failure to obey school crossing guards, failure to yield to pedestrians in crosswalks, failure to stop at stop signs, failure to stop for school buses with red lights activated, jaywalking, and more. Several officers were already scheduled to work extra hours at the beginning of the school year, and the Community and School Resource Officer program set the plan in motion that provided the funding necessary for additional units. Officers were stationed at schools in the El Dorado Hills, Placerville, and Divide areas over the course of three days. Schools that were provided with extra patrolling included Ponderosa High School, Rolling Hills Middle School, Silva Valley Elementary School, Oak Meadow Elementary School, Oak Ridge High School, Union Mine High School, Pleasant Grove Middle School, Green Valley Elementary School, Golden Sierra Junior-Senior High School, and Northside School. For more information about Placerville CHP.